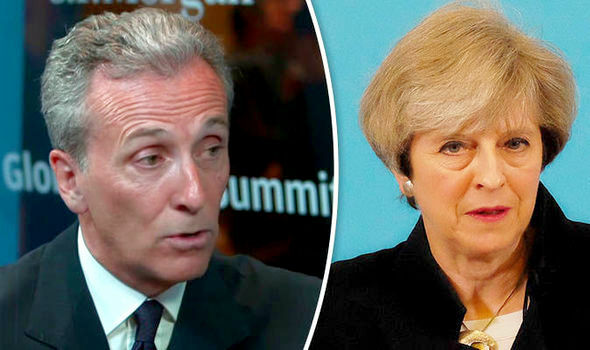 Vittorio Grilli, chairman of corporate and investment bank for EMEA at JPMorgan, said he could not see how the UK’s and EU would square their priorities in negotiations. The bank chief added there is a lot of uncertainty surrounding Brexit and any talks with the bloc would have to wait till after the German elections. Speaking to Bloomberg, Mr Grilli said: “[Divorces] are never pretty, but of course it depends on the two partners, ex-partners. “Again, there was a lot of uncertainty toward the referendum, and that came out the way it did, and now elections in Great Britain on Thursday and there is still uncertainty there on exactly what the outcome is going to be. Mr Grilli said if Brexit negotiations go badly and companies fled the UK it would also have a negative effect on Europe as it took “centuries” to create the complex City hub. He said: “London was not created in one day, it took decades, if not centuries to create such an environment. During his last functions as Director of the Treasury, Vittorio Grilli was the closest collaborator of the "late" Tommaso Padoa-Schioppa, Italian Economy Minister (2006 -2008), who died today. The most observant participants of my lectures you will remember that I cite in the Padoa-Schioppa shooting, because author of a paper-shock entitled "The European adventure teachings", which appeared in the French magazine "Commentaire" n. 87, autumn 1999. "The construction of Europe is a revolution, even if the revolutionaries are not pale and thin conspirators, but employees, officials, bankers and professors. Europe is born of a democratic movement. It is created by a method that could be defined by the term enlightened despotism. " His successor and rival Vittorio Grilli testifies that this description is very right but not completely accurate. Because if M Grilli is an "enlightened despot" to which the miracle of being at the same time "employee, officer, banker and professor" does not make it not too "pale and thin" managed. And 'the famous "bottom of the stability of the euro", which should happen on MES. M Grilli is therefore closely linked to the German Klaus Regling, director of the aforementioned EFSF, and that will be the president of the future ESM, as I reported in a previous article and how it was decided the day before yesterday. This committee, which must not be confused either with the European System of Central Banks (ESCB) nor with the Eurosystem, nor with the Council of Ministers "ECOFIN", nor with the Eurogroup, is an advisory body established by Article 114 of the Treaty of Rome (TEC), transformed in Article 134 of the Treaty on the functioning of the EU (TFEU). Composed of representatives of Member States, the European Commission and the ECB, the EFC has the task of monitoring the economic and financial situation in the European Union, the movement of capital and payments, give its views to the European institutions, and to facilitate coordination among Member States and the European institutions. With the excellent results we are seeing! In any case, it is good to know that M Grilli was president of the EFC when Germany had as a representative ... Klaus Regling. As evidence of the fact that among the Eurocrats are the same people that rotate. M Grilli belongs to the "think tank" ultra-European Bruegel, created in 2004, and whose president, from 2005 to 2008, was none other than ... Mario Monti. What remains on the other hand honorary president. As I indicated during the farce of "debate", where I was constantly interrupted by the journalist, the "think tanks" Bruegel is funded among others by Goldman Sachs.Il world is very very small. On the other hand, the "think tank" ultra-European Bruegel, with Mario Monti as honorary president and Jean Pisani-Ferry as director and of which Vittorio Grilli is a member of the Board, is not only funded by Goldman Sachs . and a life under a glass bell together with the other apparatchiks Europeans of his species. The question is legitimate to ask is why Mario Monti has decided to remit, on 11 July 2012, the post of economy minister who had maintained until today along with that of Prime Minister? on the one hand because it is not after 8 months you realize that you can not cope with two jobs. on the other side because in May 2013 will be held the next general election in Italy to renew the Chamber of Deputies and the Senate. Mario Monti who had already carried out the two posts of prime minister and minister of economy, could keep them both until their natural expiration. finally, because Vittorio Grilli, who was former vice-minister of economy, in fact held ministerial functions. Nothing, in principle, obliged to promote it. And then? Well, maybe the explanation must be sought elsewhere. Why July 11, Mario Monti has not only appointed as Economy Minister Vittorio Grilli. In front of the press he has also announced that "excluded to aspire" to a new mandate at the end of the current year. Speaking on the sidelines of the summit of finance ministers in Brussels, he recalled that he had always excluded to remain head of government after the elections next spring. It 'true that M Monti is 69 years old and perhaps believed that the age for leaving came. But this statement of renunciation, concomitant to the appointment of M Grilli, comes at a time when the financial situation and Italy's policy continues to be degraded. As I mentioned a few days ago, the interest rates of Italian 10-year bonds have reached exorbitant levels, proof of the renewed confidence of the markets. Besides everything, and although he had always declared the opposite, Mario Monti yesterday ended up contradicting himself, admitting to the press that Italy might eventually have recourse to the bottom of the euro zone stability. Now, Mario Monti is the first to know that these stability funds are still non-existent. The MES has been delayed, Finland and the Netherlands are holding, and the Karlsruhe Court will rule in no earlier than three months to determine whether the ESM should be abandoned, because they contradict the German Constitution and democracy. In short, the other hypothesis to be considered is that Mario Monti begins to admit that the coup that led to his appointment in November you are concluding with a terrible failure. It will have only delayed, but will not stop the oncoming catastrophe. This new redistribution of figurines is obviously closely followed by the "Cavaliere", the former head of government Silvio Berlusconi who was cast as household indelicate last November and that probably is maturing his revenge, as he wants a tradition thousands of years on the banks Tiber. Just today, Angelino Alfano, one of the people closest to him, he profited from Mario Monti to disclose statements to the press that a growing movement in public opinion in support of Berlusconi's return. And the Dolphin Knight has seen fit to also announce that: "I believe that ultimately will decide to show up [at the next May] elections." What else it is that a great fortune because it is the clearest indicator that the euro will not be much longer expecting to change peoples against their will. Bruegel is an independent and non-doctrinal think tank devoted to policy research on international economic issues, based in Brussels. It started operations in 2005 and has rapidly acquired reference status in European economic policy debates. Not only Bilderberg. Or the Trilateral. Not enough even the Illuminati to the collection of Mario Monti, since its establishment at Palazzo Chigi bounced daily on the web for its overt allegiances to world supermassoniche lodges. He, the prime minister, since 2004 he had founded in Europe a place of her team. It is Bruegel , a name that is discussed since its first appearance. For Monti and his men, it is a simple acronym (Brussels European and Global Economic Laboratory). For more 'suspicious, evoke the great Flemish artist of the 500, known for the representation of the blind, and' the implicit reference to the occult view of the world finance that citizens can not - and should never - see. But who 'and what it does Bruegel? They will of course define and without any embarrassment philanthropists of the European economy. In the sense that only thanks to their teaching we have in the old continent the great economists of tomorrow. And down 'funding billionaires (in front row big pharma, with giants like Novartis and Pfizer, then banks like Unicredit and UBS), economic schools in half the world, tutors drawn from the most' conservative academies in the world (even when the conservation and ' " of left"). Among the generous givers of funds are not only private, but rather 'the governments of countries such as Italy, France, Belgium, Holland and of course Germany. Let the board. When Monti leaves the post of president (remaining founding father of the association), he was replaced the former president of the European Central Bank Jean Claude Trichet. Among Italians in the front row here Vincenzo La Via, in Bruegel longstanding, but risen to fame 'only nationally a year ago when Monti became prime minister, calling him by his side as a general director of the Treasury, a position he still holds. Who 'really The Way? No mystery, but a few surprises you ', because it is a number one at the World Bank, the same body considered author's first single thought and the dreaded New World Order, that Mario Monti would be among the main architects in Italy and well. But what about the world, flowing ranking 2012 most influential of the planet 'think tank made annually by James G. McGann of the Philadelphia University, Bruegel figure in eighth place of 40 teams considered, behind giants such as Chatham House, who heads the list, and well ahead of similar formations of Russia, Germany, Britain and the United States. 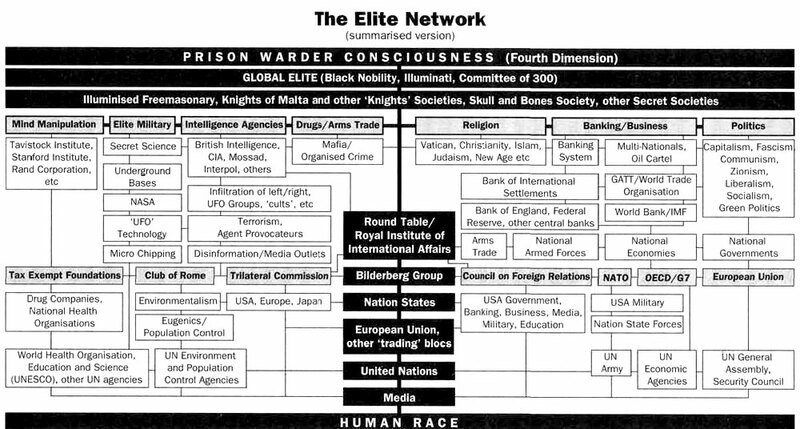 Members of the hidden Global Elite are being forced out of their cupboards,one by one, by their puppetmaster who insist they give their life-blood to save the planned NWO. 1. Develop NWO with a ´butterfly effect´ not to cause attention. 2. Create a major catastrophy killing millions of people and later become the ´Rescuing NWO´ with total control of the remaining population. Meanwhile,the global elite remains hidden in their underground bunkers until safe to re-appear.